For this month’s interview, we have Rebecca Lallier from Dothan Brook School in Vermont. Rebecca is the creator of created School Counseling by Heart to share ideas, lessons, insights, experiences, inspirations! For her first Voki project, she had her students imagined him/herself in a future career! Check them out here! I’m Rebecca Lallier, an elementary school counselor at the Dothan Brook School in White River Junction, Vermont, US. I started using Voki in the spring of 2013. 2.What are your goals using Voki? To give students the opportunity to explore their experiences and possibilities by stepping outside of themselves. Creating a Voki allows them to speak as if they have already accomplished something – behavioral change, a personal challenge, a future career – so they can “try on” the feeling of success, even before they’ve made much progress. Sometimes it’s really hard to get kids who are self-defeating or feeling hopeless to push through and keep trying at something that is hard. This is one way to hold out a beacon to them and to help them believe in themselves. 3. How do you use Voki? In the classroom setting – all 44 of my fourth graders made avatars of themselves in a future career as their final project for our Career Smarts unit. I will definitely be using Vokis in more classroom projects in the future. In individual and small group counseling sessions to help kids express themselves. To give directions that kids can access online as needed. 4. What are your 3 favorite things about Voki? 5. 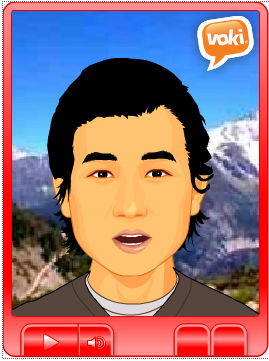 What would you add to the Voki product? More options for kid characters in the classic style and more racial/ethnic, and facial/body shape choices. The customization is great, but it’s hard for some kids to approximate how they look without some more basic characters. 6. Do you have any Voki tricks up your sleeve? Some kids and I are already cooking up some advice-giving Vokis! Want to be interviewed for the Voki blog? Send us an email at submit@voki.com!